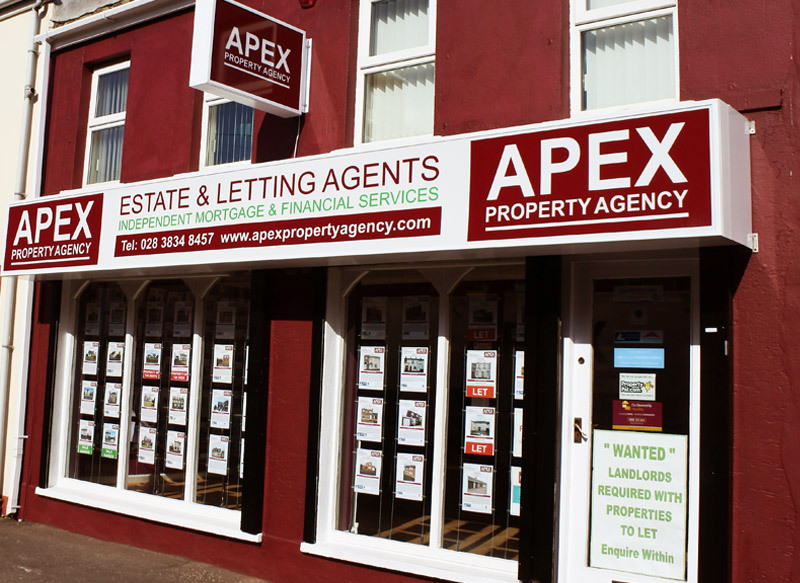 Local Estate Agent, Apex Property Agency was established in Lurgan in 2006 and continues to develop and grow in what is still a very challenging market. At Apex Property Agency we provide a comprehensive property service both on a residential and commercial basis and are committed to deliver the highest level of customer care and service throughout the buying, selling and renting process. Our team are highly motivated, enthusiastic and driven, dedicated to working creatively and effectively to meet client needs and achieve results. Supporting our Estate Agency business we have Independent Mortgage Advice and Financial Services, authorised and regulated by the Financial Services Authority, located in Lurgan. Providing a one-stop shop for residential and commercial sales, purchases and rentals, Energy Performance Certificates can be arranged from our qualified and accredited Energy Assessor who will call at your home at your convenience. These certificates are now a mandatory requirement before your property can be marketed. Apex Property Agency are open Monday to Friday 9am to 5pm and Saturdays by appointment, however we offer a service whereby we aim to accommodate our customers' requests and will aim to facilitate your needs as and when required.